Note: This dataset has been updated to version 2.3 and will be updated regularly.. Global Precipitation Climatology Project monthly precipitation dataset from 1979-present combines observations and satellite precipitation data into 2.5°x2.5° global grids. Monthly values 1979/01 through Mar 2019 (some months are interim). Long term monthly means, derived from years 1981 - 2010. 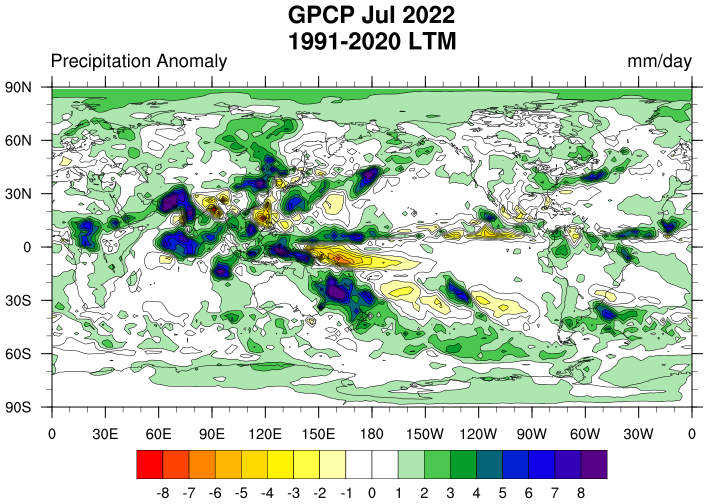 The GPCP Monthly product provides a consistent analysis of global precipitation from an integration of various satellite data sets over land and ocean and a gauge analysis over land. Data from rain gauge stations, satellites, and sounding observations have been merged to estimate monthly rainfall on a 2.5-degree global grid from 1979 to the present. The careful combination of satellite-based rainfall estimates provides the most complete analysis of rainfall available to date over the global oceans, and adds necessary spatial detail to the rainfall analyses over land. In addition to the combination of these data sets, estimates of the uncertainties in the rainfall analysis are provided as a part of the GPCP products. Note that some data at the end of the dataset may be interim. There is a netcdf attribute that has the first month of the interim data. Additional information is available from U of Maryland at http://eagle1.umd.edu/GPCP_ICDR/. Please note: If you acquire GPCP data products from PSD, we ask that you acknowledge us in your use of the data. This may be done by including text such as GPCP data provided by the NOAA/OAR/ESRL PSD, Boulder, Colorado, USA, from their Web site at https://www.esrl.noaa.gov/psd/ in any documents or publications using these data. We would also appreciate receiving a copy of the relevant publications. This will help PSD to justify keeping the GPCP data set freely available online in the future. Thank you! Please see the documention on how to cite the dataset. PSD standard NetCDF 13 Mbyte file for each monthly file. PSD standard NetCDF .5 Mbyte file for the long term mean file. Please note: If you acquire GPCP Precipitation data products from PSD, we ask that you acknowledge us in your use of the data. This may be done by including text such as GPCP Precipitation data provided by the NOAA/OAR/ESRL PSD, Boulder, Colorado, USA, from their Web site at https://www.esrl.noaa.gov/psd/ in any documents or publications using these data. We would also appreciate receiving a copy of the relevant publications. This will help PSD to justify keeping the GPCP Precipitation data set freely available online in the future. Thank you! For dataset: Adler, R.F., G.J. Huffman, A. Chang, R. Ferraro, P. Xie, J. Janowiak, B. Rudolf, U. Schneider, S. Curtis, D. Bolvin, A. Gruber, J. Susskind, and P. Arkin, 2003: The Version 2 Global Precipitation Climatology Project (GPCP) Monthly Precipitation Analysis (1979-Present). J. Hydrometeor., 4,1147-1167. Adler, R. F., G. Gu, and G. Huffman, 2012. Estimating Climatological Bias Errors for the Global Precipitation Climatology Project (GPCP). Journal of Applied Meteorology and Climatology, 51, 84-99. Adler et al., 2016. An Update (Version 2.3) of the GPCP Monthly Analysis. (in Preparation). Huffman, G.J., R.F. Adler, P. Arkin, A. Chang, R. Ferraro, A. Gruber, J. Janowiak, A. McNab, B. Rudolf, U. Schneider, 1997: The Global Precipitation Climatology Project (GPCP) Combined Precipitation Dataset. Bull. Amer. Meteor. Soc., 78(1), 5-20. Huffman, G. J., R. F. Adler, D. T. Bolvin, and G. Gu (2009): Improving the global precipitation record: GPCP Version 2.1, Geophys. Res. Lett., 36, L17808, doi:10.1029/2009GL040000 Schneider, Udo; Becker, Andreas; Finger, Peter; Meyer-Christoffer, Anja; Rudolf, Bruno; Ziese, Markus (2015a): GPCC Full Data Reanalysis Version 7.0 at 0.5°: Monthly Land-Surface Precipitation from Rain-Gauges built on GTS-based and Historic Data. DOI: 10.5676/DWD_GPCC/FD_M_V7_050. The NCEI CDR webpage is where you can get links to the metadata and download it..
U of Maryland has made a data doc page with a desciption and a recent plot. Phone: +1 301-405-4887 and the websource is http://eagle1.umd.edu/GPCP_ICDR/.